During a two-month field trip with fellow artists Dave Sellers and Kalon Baughan, we were fortunate to be in Denali National Park during the first snowfall. We almost walked past this ptarmigan without noticing it while we snacked grizzly-bear style on wild blueberries. 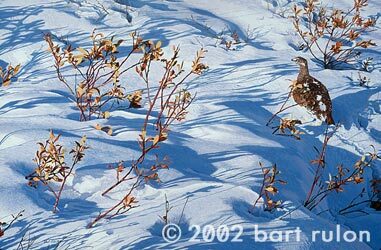 The ptarmigan turned out to be a cooperative subject and one that adds an essential element of life to a painting that is mostly about long shadows and light.